1. 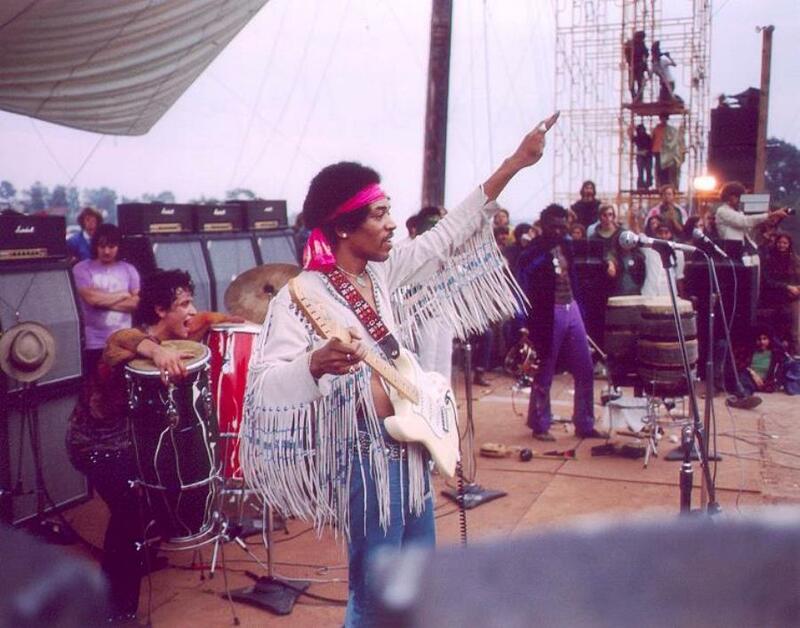 Hendrix performed with a temporary band. The Jimi Hendrix Experience, with which he had recorded three smash albums and electrified crowds at the Monterey Pop Festival two summers before, had broken up. Hendrix assembled a group he called Gypsy Suns and Rainbows, which included two musicians he had played with at the start of his career on the Chitlin’ Circuit in Nashville: bassist Billy Cox and guitarist Larry Lee. Neither had ever performed in front of a large crowd before. Drummer Mitch Mitchell, who was part of the Experience, and two percussionists rounded out the band, one of the largest Hendrix ever appeared with. The group performed just twice more before disbanding. 2. It was the only Hendrix band that included a second guitarist. Larry Lee backed up Hendrix on a number of songs, played some lead on Jam Back at the House, and contributed several lead choruses to the 12-bar blues Red House. He played some lead on both Voodoo Child (slight return) and Spanish Castle Magic and sang lead on two numbers. Lee’s solo guitar work accounts for much of the footage of the Hendrix Woodstock set that has never been made public. In fact, no recordings, audio or visual, have ever been officially released of Lee’s two featured numbers: Mastermind and a medley of Gypsy Woman and Aware of Love. 3. It was the only major performance that Hendrix gave in the morning. By 1969, Hendrix was a major star who had earned the traditional headliner’s position: playing last. Technical and weather delays caused the festival to stretch into Monday morning. The organizers had given Hendrix the opportunity to go on at midnight, but he opted to be the closer. One benefit of the delay: the morning light made for excellent filming conditions, which may be part of the reason this particular Hendrix performance is so well known. 4. Hendrix did not perform for half a million people. In fact, when he took to the stage at 9 a.m., the crowd, which once numbered 500,000, had dwindled to fewer than 200,000–perhaps considerably fewer. With the demands of work and school weighing on them, many of those fans waited just long enough to see Hendrix begin his set, and then departed themselves. 6. Woodstock was a time of transition for Hendrix. He had left behind one long-term band and not yet formed another. He was beginning a period of musical experimentation that was risky from a commercial perspective. While the Experience was dominated by white musicians (both his bandmates were white Englishmen), he was now appearing with more black performers (bassist Cox, guitarist Lee, and percussionist Juma Sultan were all African American). It is interesting, Brattin notes, that while so much of the Woodstock show pointed to Hendrix’s future, the performance also included songs that harked back to his beginnings. In particular, two of the songs Lee sang, Gypsy Woman and Aware of Love, were written or co-written by Curtis Mayfield, with whom Hendrix had performed with in the early 1960s. It was the only Hendrix concert that included these songs. 7. The Star Spangled Banner was not played on its own. It was part of a medley lasting over half an hour, one of the longest such medleys. The medley also included hits like Voodoo Child (slight return) and Purple Haze, and an unaccompanied improvisation lasting nearly five minutes. Hendrix performed the national anthem as a solo in the midst of this medley. 9. Hendrix performed an encore, a rarity. He almost never performed encores, but at Woodstock, despite the vanishing crowd, he did. On recordings, he can be heard considering Valleys of Neptune, which he never performed publicly, before or after Woodstock. He opted, instead, for Hey Joe, his first hit song. 10. Hendrix was not supposed to close Woodstock. Steeped in childhood memories of the song, Woodstock organizer Michael Lang wanted Roy Rogers to come on after Hendrix and play Happy Trails. The cowboy crooner declined. For more, be sure to see our other posts on the hippie movement and Woodstock photos that will transport you back to 1969!